I briefly talked about project Klerksdorp which was similarly to Google Streetview which I have actively developed at the time. Almost 8 years before Google launched Google Streetview. I also talked briefly about the support that we get as entrepreneurs being part of the Maxum Digital Innovation company. I talked about our own efforts to develop virtual reality headsets and the camera that we have developed for 360° Video. I touched on some of the Virtual Reality Brand games that we developed for ABSA Bank as well as for DSTV and how South Africa is utilizing the technology. I also talked about Virtual Reality in e-sports and the future of virtual reality. Virtual Reality is an old technology and dream of many in the past. It is only now that we have the technology to confidently say that virtual reality is now at a stage where we can build affordable software for it. What is eSports and VR? The concept behind eSports, and VR is simple. Just like in the real world we can now start playing sports in virtual reality. In virtual reality we can be a spectator watching existing sport in Virtual Reality, or we can actually play sports that are only (or sport that will only be) available in Virtual Reality. I used the example of archery as a virtual reality game. In virtual reality you could essentially have a competition to find the worlds best virtual reality archer and have people compete against each other for the top spot in the world. You can have different age groups competing against each other, and run a competition where no one have to leave their homes to compete. How has these innovations changed being an entrepreneur in the digital space? For me personally this is one of the most exciting places to be in technology at the moment. If you look at virtual reality it is literally a land full of opportunity. In virtual reality you can own land / space and you can own as much space as you would like. In this space you can almost build anything that you want, without having to have real infrastructure. In virtual reality you can create as much infrastructure as you want. Virtual Reality is also completely decentralized from anything – no government, political institution or corrupt officials have any influence on something in Virtual Reality at the moment. There is also no boundaries in Virtual Reality and it is an international market place without any borders or restrictions. In essence you can sell your product to anyone in the world in the virtual world there is no boundaries. 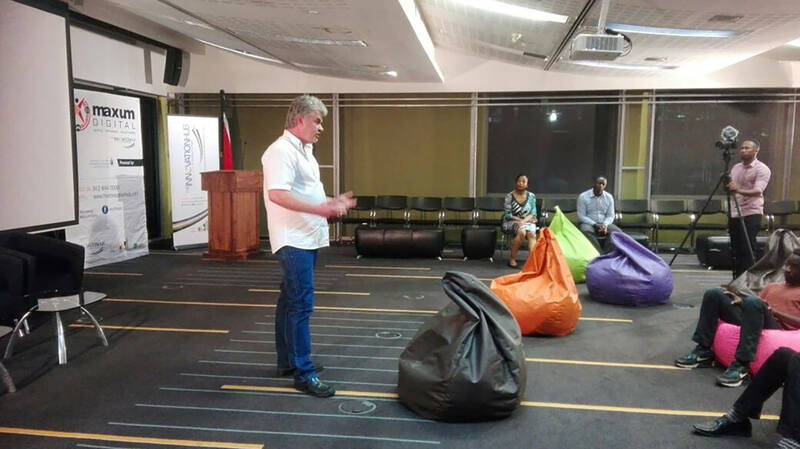 Has the South African Gaming & Virtual Reality space met the global entrepreneurship standards? What are some the opportunities that a start-up could explore? I personally think that in many ways we are leading the virtual reality industry in the world. I know that our company have been doing stuff well before most major companies started venturing into virtual reality. Our company still have many things up our sleeves which international companies with huge budgets and investment capital have not yet even touched on. The opportunity for Virtual Reality is endless, at the moment it is barren land that is up for crabs and any programmer serious about virtual reality have ample opportunity. The key to innovation and opportunity is innovate + commercialization = innovation. In the virtual world you just need to create content – exceptional content and people will come. It reminds me of the movie “Field of Dreams” – if you build it they will come. The key for startups is to have a commercial arm, that can help raise funds necessarily to start your project, develop it and to make money from it. You have an idea, and have started working on it but still need to survive financially, how do you keep doing what you love while making money? Our model is simple at the moment, we find clients whom we know could benefit from virtual reality, and offer them the solution. The companies that we choose to work with generally need something that we need to develop ourselves in order to move forward. We use the experience that we gain from working on these companies virtual reality solutions to increase our know-how and knowledge. One of the most expensive things in VR at the moment is the hardware. In most cases we will re-invest the money we earn from a project to buy the equipment that we need to make ourselves more competitive. Besides crowd funding and kick starting, what practical ways are there to raise startup funds? At the moment we are in the fortunate position of being pioneers in virtual reality our online presence is well established. We will go to schools and events and demonstrate our services to potential clients. Our company at the time of writing have not yet raised funds through crowd funding or venture capitalists. Could you break down the different revenue streams one can work towards in the eSports and VR environment? One of the most common places to start at is to release your game on the Oculus Rift platform or the Steam platform. These are the number one places where people with High-end virtual reality devices like the HTC VIVE or the Oculus Rift buy there games from. Both these platforms will allow game developers to sell their games through these software platforms if you game meets the required criteria. It is also a good idea to link up with other industry professionals via Social Media channels and to find out from them how they are making money from their games and virtual reality software. There is various different revenue models that you can follow, people can outright purchase your game or software or you can have in game purchasing options or even use a Freemium based model. A new phenomenon in online trading and commerce is to use crypto-currencies and it is becoming very popular in selling software online. Intellectual Property is very important within the digital space. Can you explain briefly what it is and what entrepreneurs should look out for in developing their ideas? So recently a well-known company asked me to sign an NDA with them. I almost signed the Non Disclosure agreement without reading properly through it. It turned out that the NDA was a Non Disclosure agreement and also a Non-Competitive Agreement and also an agreement where I sign all my Intellectual property over to the company by default. Luckily I read the contract and discovered these hidden clauses before I signed the agreement. My number one advice would be to read everything carefully before you sign it, secondly get a lawyer to look over a contract before you sign it, and lastly do not worry to much about patents and those kind of things if it is going to delay your going to market time significantly. In today’s world it is very difficult to come up with a truly unique idea and to get it patented before someone else thinks about the same thing and enter the market before you have finished filing for patents and rights. Create a good software license agreement for your software and use copyright to protect it. If you truly have something unique it maybe a good idea to speak to a patent attorney whom can advise you appropriately. In my own personal opinion I hold my coding close to my heart and do not ever share full source code with clients or colleagues. eSports, or competitive gaming, has become huge, with an estimated global year-on-year growth of 43% in 2017 to $696m, and an estimated audience of 385 million people globally, is South Africa aligned to take advantage of this booming industry? The cost of entry to produce virtual reality software is very high. In my personal experience it is very difficult to get someone to invest in your company and to just give you the money to start your business. My advice would be to start small and purchase yourself the necessary equipment to start programming in VR. You cannot program in VR if you do not have descend hardware to test your software in. I was shocked recently when we had to complete a wish list for equipment at the Maxum Digital Lab and I saw some of the equipment people were wishing for. It is extremely important that you make sure that you have the right tools for the trade when entering Virtual Reality software development. I believe that we could be among some of the leaders in e-sports but the industry will need to get a serious investor or sponsor to invest in hardware and resources for entrepreneurs entering the Virtual Reality sphere. I believe that at the moment many South African companies that say that they do VR is not aligned with the international standard and is likely never to be simply because of a lack of investment and equipment. However there are some companies whom have bridged / and raised their own capital whom could be leaders in the fight for dominance in the Virtual Reality Gaming and eSports enviroment. Collaboration, what are some of the ways gamer, developers & creatives can work together to develop the market? People can raise money together and purchase equipment more easily by sharing the cost of equipment and use the equipment as a community. It is also always good to have someone that shares your passion for the industry. There is an old saying – two brains are better than one, and by working in a community you can likely find someone whom will be able to contribute positively to your ideas and work-flow. In my personal experience working together with like-minded people let you move forward. Just one note of warning do not become so involved in the community and the politics or dreaming that you do not do! – The key to success is to do!